Senior Daniel Bernabe is a baller on the football field. Not only is he an exceptional athlete and a great guy all-around, but he’s also a totally awesome teammate. Last season Bernabe switched positions from Tight End to Defensive Lineman and had an outstanding performance. Head Coach Kevin Navarra is all too happy to talk about the all star he is lucky to have on the field. When asked why Bernabe deserves Athlete of the Month, Navarra states, “Daniel Bernabe is the perfect example of TEAM Comes First. Last season he switched positions because the TEAM had a need. This season, he is a starting defensive and offensive lineman.” Coach Navarra also says that the difference Daniel makes on the field is his leadership. He was selected to be a THOR leader by his teammates and he sets the example in the weight room and on the field by working hard at improving his game. “Daniel is by far one of the best defensive players to play at BC. He had the ability to read his keys versus offensive linemen that are twice his size. 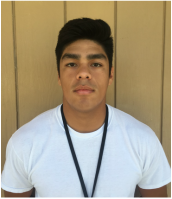 Daniel is one of the strongest players on this years football team.” Navarra has great confidence in his team’s performance this season, especially with a strong all-around utility player like Bernabe. Q: How does it feel to be elected Athlete of the Month? It feels good, it feels good to be looked at as one of the best defensively. Q: How do you feel about your team this year? I think we’re a good team overall, we have a lot of good players. We’re better than last year, we just need to come together and do the little things right. If I could have a superpower I would want to be able to fly. It’d be cool to see everything from above and be anywhere you want. Q: If you were a fruit which one would you be and why? If I were a fruit I would be an orange, I like oranges. They taste good! Q: What’s one thing not very many people know about you? One thing not very many people know about me is that I was homeschooled freshman year. It’s funny because I only started playing football my sophomore year, while these guys had been playing for four years. I started sophomore year and didn’t actually get to play until my mid-junior year… so it’s kind of cool that now I’m considered one of the best they’ve ever had. Daniel Bernabe is a hardworking athlete that puts his team first, and he looks at the team’s needs before his own. According to Bernabe, this football season so far seems different, and that there is light at the end of the tunnel to pull out of mediocrity. The BC family will always be supporting our boys, and we are looking forward to what this season has in store! Go Thunder! !